The Compatible Alternative for Excel (Yozo Office) is an alternative Office suite compatible with both binary (xls, doc, ppt etc. ) and XML (xlsx, docx, pptx etc.) file formats with several value added features. Yozo Office is an affordable alternative for Excel and Office and has been developed with powerful integration by providing one single application for spreadsheets, text documents and presentations with data links that provide real time updated infomation between the outputs. This ensures that, form example, written documents and slide show presentations are updated with refreshed data as spreadsheets and recalculated and updated. This compatible alternative for Excel, Word and Powerpoint also provides a unique Science Editor for editing and publishing mathematical and scientific documents through powerful equations and related visual representations. Microsoft Office compatibility: Yozo Office can open and edit Microsoft Word/Excel/PowerPoint 97/2000/XP/2003/2007/2010 files and save these files in the native .EIO binder file format or in the original file format. Innovative Integration: One program that allows to move seamlessly among text documents, worksheets and presentations. Link data between documents as easily as copy and paste and when changes to the source data are made linked data in other documents update automatically. Convenient Science Editor: powerful mathematical formula editor and scientific experiment outcome analysis. Analytical tools and diagrams include biology, chemistry, physics, mathematics, geology, graphics, flowcharts, languages and customization options. Look and Feel of Microsoft Office: similar graphical user interface (GUI) and tool bars, dialog boxes and quick keys all correspond to a standard Microsoft Office graphical layout. Store all Documents in a Single Binder: file extension supports worksheet, text document and presentation data allowing multiple document types to be stored and displayed in a single file. Paste Link Office Data: worksheet, text document and presentation data contained in the same or different binders, can be inserted in other documents and updated in real time. Changes in the formatting or contents of a table, cell, heading or slide automatically update in all linked worksheets, reports and presentations. Flexible Publishing Of Documents: documents can be exported to Microsoft Office formats or exported to Adobe Portable Document Format (PDF) directly from the desktop without the need for an additional document converter. 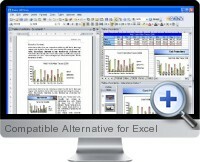 The Compatible Alternative for Excel and Office is available for both Windows and Linux operating systems.